Poland’s earliest comic works, so reading this should make you smirk… But it wasn’t all fun and games, for the youthful years of the ‘funnies’, as they used to be known, coincided with the grim times under the interwar period of Piłsudki’s Sanation, Nazi German occupation and what the communist regime called the ‘people’s democracy’. So Grześ is off to war tonight. So began the first ever Polish comic Ogniem I Mieczem, Czyli Przygody Szalonego Grzesia (By Fire And Sword, Or The Adventures Of Crazy Grześ) from 1919, a grotesque tale of the struggle to demarcate the borders of the Second Polish Republic. So our comic strips are now approaching their hundredth anniversary, though their roots may be traced back to the nineteenth century: in children’s ‘stories in pictures’ (illustrations with rhyming texts underneath) and satirical press cartoons. First and foremost, we should mention Franciszek Kostrzewski, an artist from the Warsaw newspaper Tygodnik Ilustrowany. He set out to ‘create something small, funny, cheap, and up-to-date’. As such, his graphic series, e.g. the adventures of Jedynak and Jedynaczka (Only Child and Only Childess), became proto-comics. These were educational yet humorous tales of the lives (from cradle to grave) of pampered landowners’ children, too idle to study or work, who frittered their time away in the pursuit of pleasure. But let’s return to Grześ. This illustrated series, published in the satirical newspaper Szczutek from Lviv, was the brainchild of caricaturist Karol Mackiewicz. He was joined by writer Stanisław Wasylewski, who produced the ‘suitably goofy captions’ (as he put it). Grześ would fight wherever he could: with Ukrainians for Lviv, and with Bolsheviks and Germans in Greater Poland and Silesia. His good-natured face immediately showed that he was the salt of the earth, vaguely resembling Hašek’s Szwejk (although Szwejk was never one for brawling), with a fondness for the ladies and a life full of adventure. As opposed to the likeable Grześ, his enemies were cowardly (‘The Russky skedaddles / His pants round his ankles’) and brutal (‘What an uncouth thing to do: hacking someone right in two’, remarks the narrator as the Bolsheviks are butchering Grześ). Grześ was also partial to a little cruelty himself, ordering a captured profiteer to be torn apart by horses, dutifully illustrated with flying limbs. The series continued with strips about Grześ’ children, the twins Kubuś and Bubuś, who were forever chasing black-marketeers or shooting Bolshevik spies. It was no longer published in Szczutek, but in a paper aimed at 6- to 12-year-olds. Slightly later, from 1920 onwards, Hanys Kocynder was popular in Silesia. Kocynder means ‘jovial’ in Silesian, and his stories appeared in an eponymous political satire magazine. They also contained a propagandist message – even though the hero is a lifelong hell-raiser who ‘swears “by thunder” like a trooper and drinks like a fish’, he has a national identity, and knows he must vote for Poland in the plebiscite. The comic tells of his turbulent life, in which he manages to experience the Texan gold rush, and fight on all the fronts in the Great War, before returning to his homeland and setting an example to others with his patriotism. 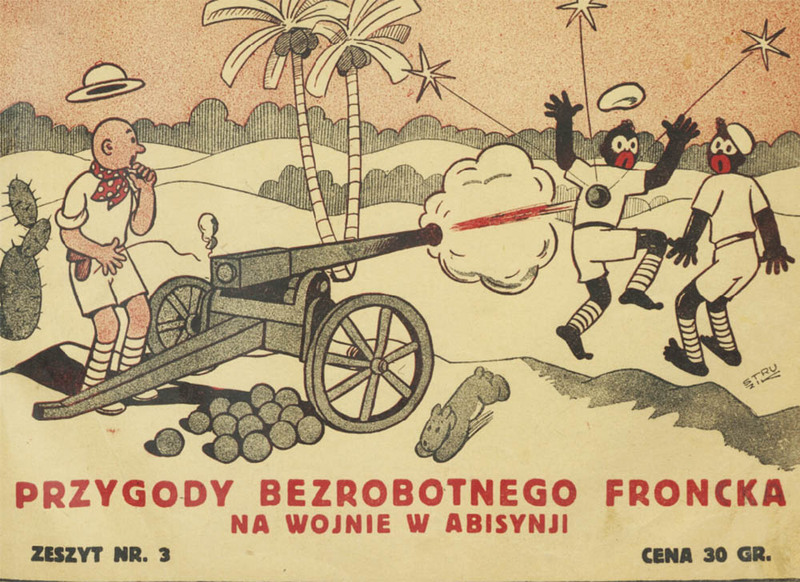 20th-century Polish comics were mostly a press phenomenon, and rarely appeared in book form. Starting with its first issue in 1923, the leading newspaper for illustrated stories was the most popular tabloid of the time, Express Ilustrowany from Łódź. Stanisław Dobrzyński’s comic strips suited the paper’s sensational profile and featured love stories of ‘lodzermenschen’ (e.g. Don Juan Cyperman and Lola Gzyms), often with a hint of eroticism. Not all of them were heteronormative, however, for example the short story of Loulou the transvestite, ‘the pride and joy of Łódź’. My ear stopped aching the minute Mum bought me some comic papers. There were comics printed in colour on the front and back pages of weeklies such as ‘Karuzela’, ‘Świat Przygód’ and ‘Tarzan’ […] They were published once a week and cost ten groszy. […] I was ten years old when I read a comic called ‘Ferdek and Merdek’ in Karuzela. Imagine my surprise when I went to America in 1966 and saw the same characters in the adventures of Popeye the Sailor in their newspapers! It was common practice to Polonise borrowed heroes. Superman adopted the Slavic name of Burzan, and his adventures were entitled The Superman of Tomorrow. Following the destruction of Planet Krypton, he lands somewhere near Kalisz, where he is taken in by a family of Warsaw factory-owners. Flash Gordon became Błysk Gordon, but another paper rechristened him Jacek Żegota – ‘the epitome of the modern Polish knight’. Tarzan was also Polonised: not only did he assist Polish travellers in Africa, but he eventually turned out to be a Pole himself – Staś Karolek Smolkowski, who had been lost as a child. Betty Boop went by the name of Baśka Figlarka (Babs The Prankster) in the girls’ paper Wiosenka. Donald Duck amused Gazetka Miki’s readers as Kaczorek Zadziorek (Plucky Ducky), and in Ilustrowany Kurier Codzienny (IKC), Goofy became plain old … Burek (Rover) the Dog. The same approach was applied in the adult press: Adamson, the hero of a hugely popular Swedish series, was renamed Agapit Krupka in IKC, but also went by the monikers of Ildefons Kopytko and Mikołaj Doświadczyński in other papers. Stories for children and adults alike usually featured captions (often rhyming), and speech bubbles were extremely rare. In that respect, the pioneers were Pan Bujdalski and Kaczorek (Mr. Bujdalski and Ducky; originally named Peter Og Ping) in a very funny comic imported from Denmark. Of the titular duo, Pan Bujdalski revealed himself to be cunning and foolish by turns, but always a master of the snappy comeback, while his sidekick Kaczorek (a penguin in the original) commented on the situation from the sidelines. But, as they say, ‘Poles are no geese’, and have stories of their own, drawn by local artists. 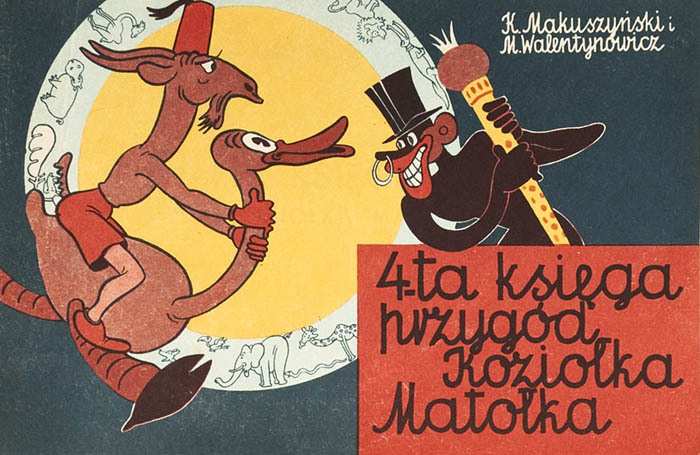 The bestsellers were the still-famous series Koziołek Matołek (Matołek The Billy-Goat) and Małpka Fiki-Miki (Fiki-Miki The Monkey), produced by the duo of Kornel Makuszyński and Marian Walentynowicz. The latter also drew characters for children’s newspapers, e.g. Imć Tchórzak (Scaredy, Esq.) the Hare and the street urchin Jurek Czupurek (Quarrelsome Georgie), packing them off to exotic countries. Another world traveller in comics was Fucinka, by Stefania Bańdo-Stopkowa, drawn in the style of children’s doodles. Fucinka originally grew out of an ink-blot, so two decades later, the famous Tytus de Zoo of Tytus, Romek, and A'Tomek wasn’t the first example of such unusual origins in Polish comics. There are many words to describe the most popular type of Polish pre-war comic heroes: drifters, rascals, vagabonds, rogues, scallywags, scamps, etc. They often came in pairs that relied on diametric opposites: one tall and thin, the other short and chubby, like Laurel and Hardy, who also featured in their own newspaper strips at the time. 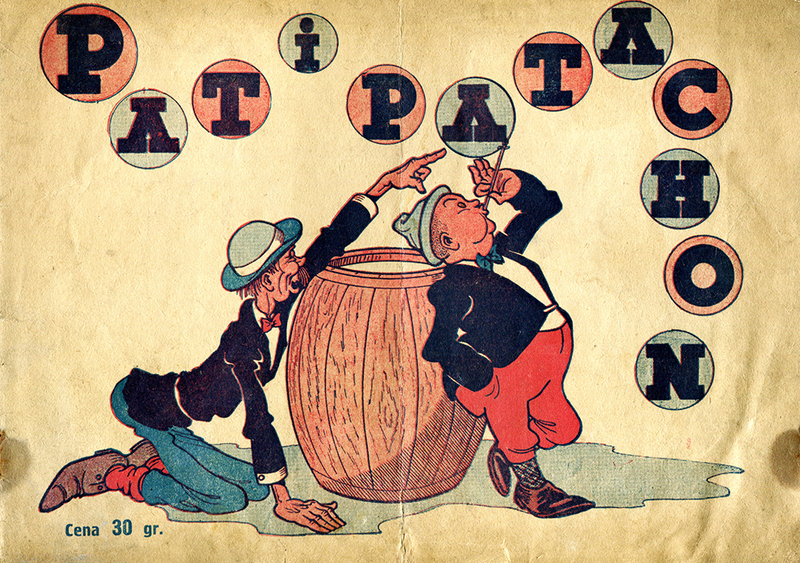 In this category, the leaders were Pat and Patachon, who also arrived directly from the silver screen as the comic counterparts of two famous Danish comedians of the time. One day, Express Ilustrowany failed to receive the printing plates from Copenhagen on time, so the artist Wacław Drozdowski was commissioned to draw the series. From then on, the characters acquired local colour. They lived in the quaintly named town of Grajdołek (‘Nowhereville’, which was uncannily similar to Łódź), and the pages teemed with characters you might meet on any Polish street corner: coachmen, policemen and courtyard cutthroats. This gallery of comic slackers included Bezrobotny Kuba (Unemployed Jake), who traipsed around Łódź, dreaming up money-making schemes, or Pączka and Strączka (Bud and Pod), for whom ‘work was the worst invention”. The latter must be given their due, however, since they did find honest employment for themselves as the series evolved, by setting up a detective agency. Normal townsfolk also made occasional appearances in the background among this band of vagrants, e.g. the series Rozkosze I Przykrości Pana Wyżerki Z Rodziną (The Delights And Troubles Of Mr Greedyguts And Family) or Tarapaty Wuja Łyka, Który Chętnie Piwo Łyka, I Radości Cioci Ali, Która Postęp Sobie Chwali (The Troubles of Uncle Glug, Who Chugs Beer By The Mug, And The Joys Of Auntie Nell, Who Believes Progress Is Swell), whose main conflicts were contained in their titles. There was also Pan Hilary by Antoni Bogusławski and Kamil Mackiewicz. He was a landowner from the borderlands who, despite his upper-class background, was much like the others in his recklessness and penchant for a dissolute lifestyle. Polish film stars also featured in their own strips, e.g. Lopek and Dodek, a.k.a. Kazimierz Krukowski and Adolf Dymsza. Dymsza’s alter ego in the comics was another endearing hustler from the streets of Warsaw. One more readers’ favourite well-rooted in reality was Bezrobotny Froncek (Unemployed Froncek), the hero of Franciszek Struzik’s long-running series published for more than seven years in the Katowice tabloid Siedem Groszy. 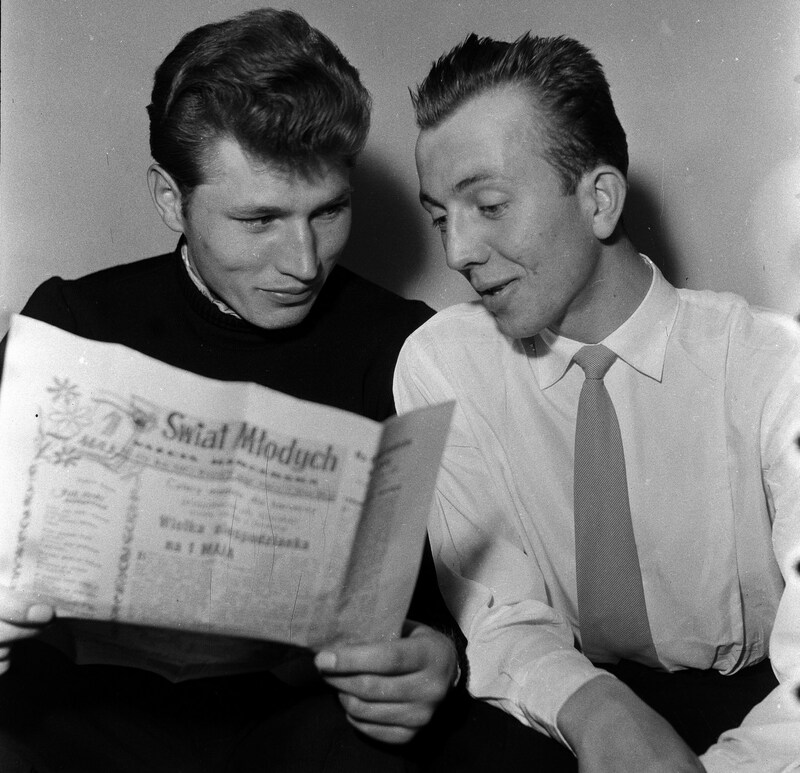 Froncek became the mascot of the newspaper (which belonged to the Christian-Democrat leader, Wojciech Korfanty) and boosted its sales incredibly. He was so popular that, in 1939, Katowice newspaper vendors agreed to allocate part of their earnings to the National Defence Fund, on the condition that the money be spent on a bomber, to be named after their favourite comic hero. Froncek had an exemplary service record – Haller’s Army, the war with the Bolsheviks, the Silesian uprisings – but it was of little use when he was starving in one episode, and was forced to sell a medal (‘But you’ve got to live somehow / For your bravery and merit / Someone else will get the credit’). He also begged, worked in an illegal mine, and sometimes got caught by the police for vagrancy (then he was glad of a free meal and a roof over his head). In one episode, he came up with a peculiar way to make money during the depression – by standing at a funfair with a sign round his neck reading: ‘Hit Back at the Depression (Price: 10 groszy a punch)’. Despite his cheerful disposition, such a life also took its toll on him. According to Polish comics researcher Adam Rusek, during Froncek’s first year of adventures in 1932, he tried to commit suicide three times. Unemployed Froncek walks boldly through life, and would surely have found himself a good job a long time ago, were he not ‘Unemployed’ Froncek. Froncek also appeared wherever anything was happening worldwide: cheering at the Berlin Olympics, witnessing the Spanish Civil War, supporting the Abyssinians in their war against the Italian fascists, and visiting China and Palestine. He was not alone in this; it was a popular trick for Polish writers to place their characters in settings connected to current affairs. This usually resulted in a slew of stereotypes. If the protagonist encountered a local tribe in Africa, you could be sure they were cannibals and he would end up in a cauldron, and so on. While abroad, Froncek met characters such as Kastanietto Tango from Spain, Ladaco-Kakamura from Japan, and Antoni Piczikatto from Italy. 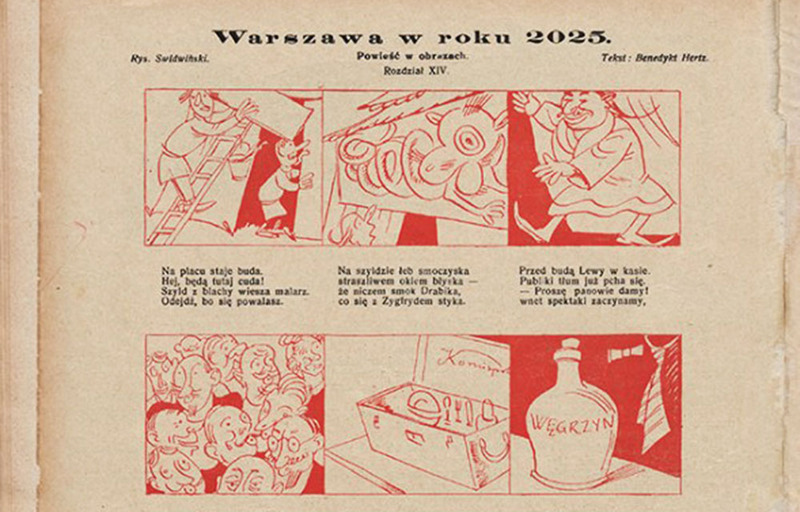 Warszawa W Roku 2025 (Warsaw In The Year 2025) was based on an interesting premise, and was later reprinted in the Dawny Komiks Polski series. This rhyming story, written by Benedykt Hertz and illustrated by Aleksander Świdwiński, recounts the adventures of a couple who, wishing to dodge the depression, inhale anaesthetic gas and sleep for a whole century. When they wake up, Warsaw turns out to have been overrun by the Chinese. The former Ziemiańska Café has become an opium den, and homelessness and the housing shortage have been resolved by floating houseboats on the Vistula River. This futuristic backdrop was merely a pretext for satire on current affairs, and there were numerous references to the realities and famous names of the 1920s. Whenever creators delved into political themes, their comics usually lacked what we would now term political correctness, and served as propaganda for a specific party. This was the case with Kazimierz Grus’ strip Prot and Gerwazy in the National-Democrat paper Orędownik. They were another pair of vagrants like the ones mentioned above, but had ‘proper Polish names’ and were forever sniffing out Jewish or Communist plots, or cursing life under the Sanation (although it was rather an odd concept to make two scruffy rogues into ‘defenders of the nation’). Once, they even beat up their rivals, Pat and Patachon, whose adventures were published in a paper that right-wingers regarded as a ‘Jewish gutter rag’. Gnawing bones with rumbling stomach. Wicek experiences poverty, hunger, slave labour, the gulags, and the terror (n.b. according to the comic’s anonymous author, the USSR’s entire system of control and repression was staffed by Jews persecuting the kind-hearted Orthodox people). In the end, he manages to escape the Soviet Union (via Spain) and radically changes his life: working assiduously, promoting temperance, and chasing penny-dreadful peddlers out of tenement courtyards. Breakfast’s nothing but a sham / There’s naught to nibble or to sup. But there’s meat in great abundance / And of that you can be certain! In Leipzig, Berlin, Gdańsk and Szczecin / There’s lots of fodder for the cannon! At the beginning, our job seemed simply unbearable. We, who had been waging a holy war against Disney’s clichés, and comics featuring idiotic scripts for the illiterate […] were now stuck in two rooms whose walls were plastered in abominations like Mickey Mouse – whom we loathed in those days – poisoning […] our young hearts and minds. This group’s attitudes to comics would come to shape the fate of the genre after the war, and Julien Bryan’s photo of children reading the paper amidst the rubble, during the siege of Warsaw in September 1939, soon became famous the world over.